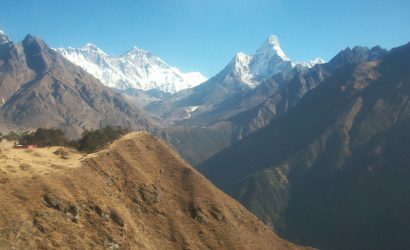 Kathmandu and Pokhara Tour - FIRST ENVIRONMENTAL TREKKING Pvt. Ltd.
Pokhara is one of the most beautiful tour valleys of Nepal. It is a sub-capital of Nepal, located in the middle of the hilly region of Nepal where thousands of people visit every year. 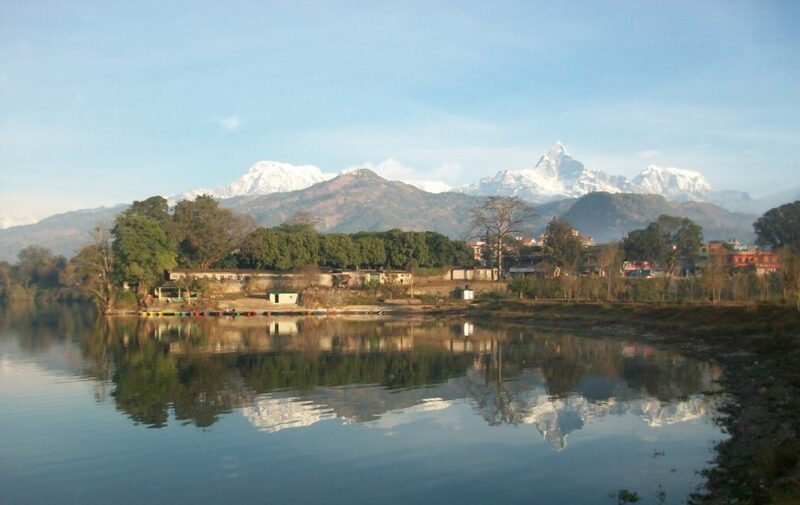 Pokhara has 5 major lakes. 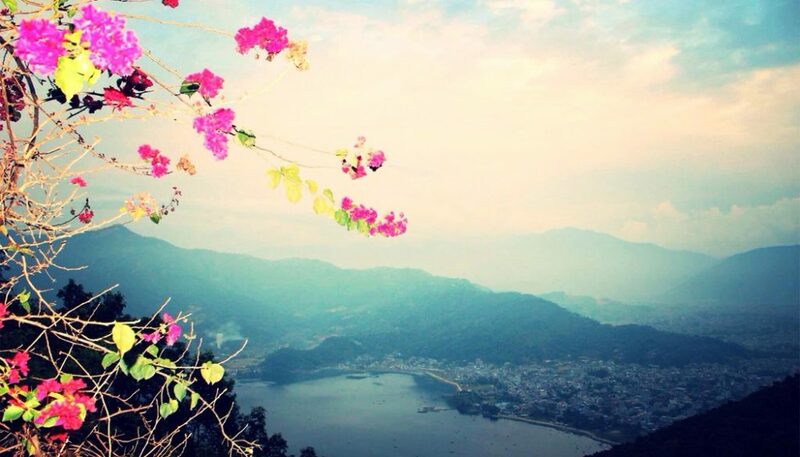 Among them, Phewa Lake and Begnas Lake are the major tourist-attracting lakes. Likewise, Bungee Jumping, Sarangkot Paragliding, Sightseeing of David Falls, etc. can be done in this valley. 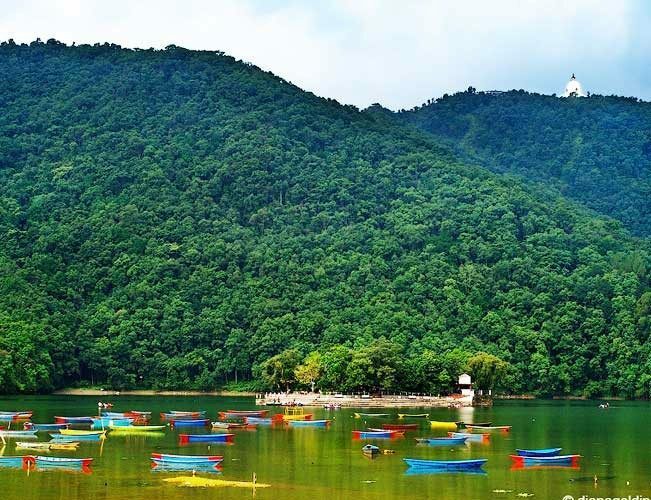 Pokhara is located at nearly 200 km from Kathmandu Valley. It takes nearly 4-5 hours to reach Pokhara from Kathmandu. 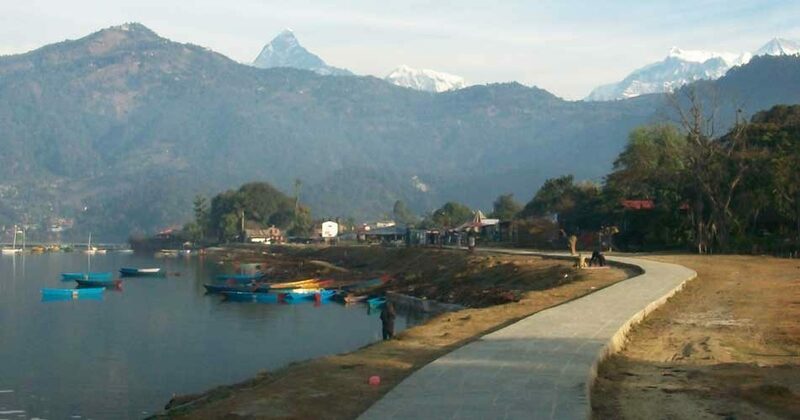 Tourists also visit Pokhara to see the mountain ranges: Annapurna Range and Mt. Machhapuchhre. It is a destination where every tourist wants to do multiple holiday activities like sightseeing, visiting Mahendra Cave, paragliding in Sarangkot, rafting, honeymoon tour, boating in lakes (Phewa Lake, Begnas Lake, Rupa Lake, etc. ), Fishing, International Mountain Museum add night parties. Though Pokhara is a crowded city, it is quite a calm and peaceful one as well compared to cities like Kathmandu. Pokhara is one of the most expensive cities of Nepal, and it is also the gateway to Muktinath Tour and Upper Mustang Trek. Similar to other areas in Nepal, Pokhara also offers a vast diversity of castes and ethnicity. When you go for boating in Phewa Lake, do not forget to visit Tal Barahi temple, which is located exactly in the middle of the Phewa Lake. Boating in twilight in Phewa Lake brings great joy to people. After having delightful breakfast at the hotel, we will take this day to go around the historical town of Kathmandu for some sightseeing. The sightseeing tour will take you to some of the ancient temples and historical places of great religious and spiritual importance for both the Hindu & Buddhist religion. We will start the sightseeing tour in our private vehicle with a member of our staff for guiding you through the whole sightseeing tour. We will start our Tour with the great Hindu Temple Pashupatinath. Pashupatinath: Situated 5 kilometers east of Kathmandu City, Pashupatinath temple is one of the holiest temples dedicated to Lord Shiva. Situated amidst a lush green natural setting on the bank of the sacred Bagmati river, the temple built in pagoda style has jilted roof and richly carved silver doors. 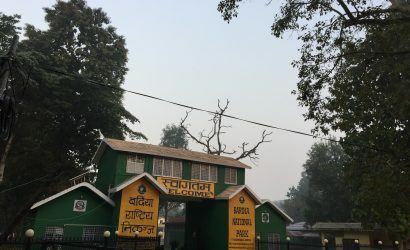 Visitors will be permitted to view the temple from the east bank of Bagmati River, entrance in the temple being strictly forbidden to all non Hindus. Pashupatinath is the centre of annual pilgrimage on the day of Shivaratri, which falls in the month of February/March. Behind the temple are the cremation grounds. After Pashupatinath we head towards Boudhanath, another magnificent pagoda style Buddhist stupa famous for its nickname “The little Tibet”. 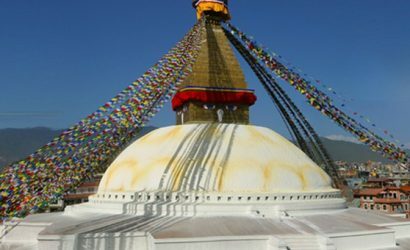 Boudhnath: This Stupa, 8 kilometers east of Kathmandu City, is one of the biggest in the world for its kind. It stands with four pairs of eyes in the four cardinal direction keeping watch for righteous behavior and human prosperity. This Buddhist Stupa was built by King Man Deva at the advice of the Goddess Mani Jogini. It is built on an octagonal base inset with prayer wheels. The shrine is ringed by houses of Lamas or Buddhist priest. After finishing the tour around Boudhanath, we head towards Kathmandu Durbar Square, another small site also listed on the UNESCO world heritage site for its great religious importance. Kathmandu Durbar Square: Kathmandu Durbar Square is one of the major attractions in Kathmandu Valley. The word “Durbar Square” is translated in English as Palace Complex. 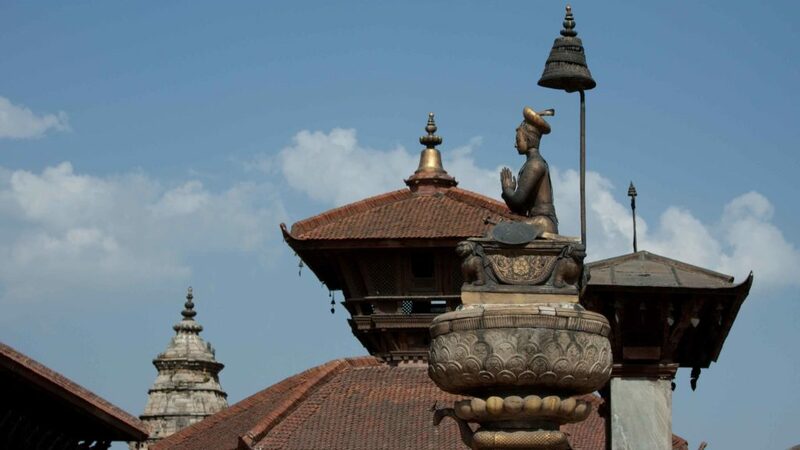 The Durbar Square, with its old temples and palaces, epitomizes the religious and cultural life of the people. After concluding the tour around Kathmandu Durbar Square, we will head towards Swayambhunath, nicknamed the “Monkey Temple”. 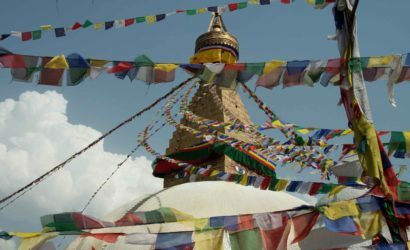 This buddhist stupa holds some great artistic and magnificent small Buddhist monasteries which provide you with some great Buddhist culture and tradition. 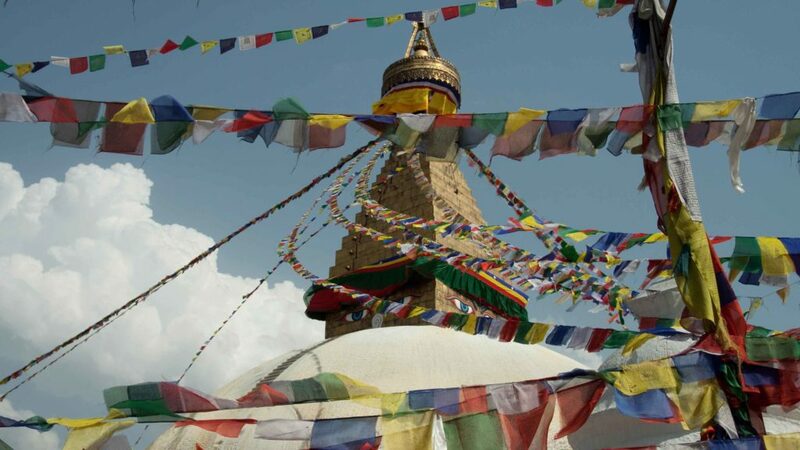 Swayambhunath: Swayambhunath is located approximately at 4 kilometers west of Kathmandu, and this buddhist stupa is said to be 2000 years old. The Stupa which forms the main structure is composed of a solid hemisphere of brick and earth supporting a lofty conical spire capped by a pinnacle of copper gilt. Painted on the four-sided base of the spire are the all-seeing eyes of Lord Buddha. This hill is a mosaic of small Chaityas and Pagoda temples. After seeing these magnificent places, we turn back to hotel for rest. Overnight at hotel. Accommodation in the hotel in Kathmandu. Accommodation in the hotel in Pokhara at lakeside.